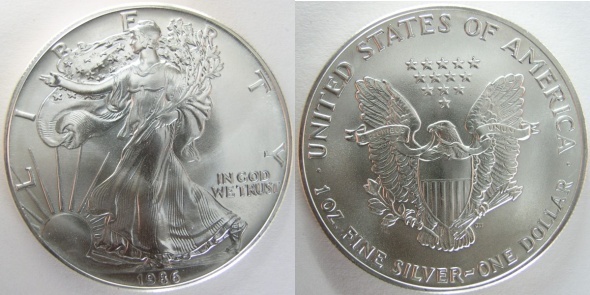 US Silver Coins have been made in a variety of denominations during the history of United States Coinage. They range in size from three cents to one dollar, with many varieties for most denominations, making them interesting to a wide range of collectors. The seven denominations of US Silver Coins include three cent pieces, half dimes, dimes, twenty cent pieces, quarters, half dollars and dollars. The wartime nickel of 1942 to 1945 could also be added to this list as a collectible silver coin considering that it was made of an alloy containing 35% silver. Up until 1965, all United States dimes, quarter dollars and half dollars were made of 90% silver and 10% copper. The Coinage Act of 1965 changed the compositions of these coins to reduce or eliminate their silver content because the price of silver had risen above the face value of the coins. Dimes and quarters were replaced with clad coinage that was a 75% copper/25% nickel outer layer bonded to an inner core of pure copper. The 90% silver content of the 1964 Kennedy Half Dollar was reduced between 1965 and 1970 to a net composition of 40% silver with outer layers of 80% silver/20% copper bonded to an inner core of .209 silver and .791 copper. The silver content was completely eliminated in 1971 when half dollars and dollars met the same fate the dimes and quarters had in 1965. A collectible silver coin was made from 1971 to 1976 however. Eisenhower Dollars containing a net composition of 40% silver were made especially for collectors. Coins released for circulation during this time were of the copper/nickel clad variety. Currently, US silver coins are made only for collectors and investors in the form of Silver Bullion Coins, such as the $1 American Silver Eagle, and Commemorative Coins. Commemorative Coins are made to celebrate and honor American people, places, events, and institutions. Both bullion and commemorative coins are legal tender but are not intended for circulation as their metal content is worth much more than their face value. Below you will find a list of US Silver Coins. Clicking the links will take you to more information and images of these collectible silver coins as that information is added to the site. Learn where the mint mark is located on US Coins.